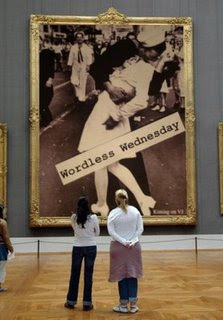 Welcome to Wordless Wednesday hosted by my friend Dixie down in Fench Lique, Texas. Please be sure to visit her wonderful blog to see what's going on in Fench Lique and to find a list of the participants. You can also get the word for the day and join in on the fun! I love you, too, honey! You are the best grandson ever!! Cards, notes and pictures are all priceless when they come from children. Oh...I "heart" this! :-) Very sweet! Ah----that is just the sweetest!! I hope my little grand girl will make some cards for me when she gets a bit older!! A great share!!! PS regarding the kitty in my post picture--I found her last Summer nearly dead from starvation. I took her to our vets--they determined she was disease free and declawed and severely malnurished and dehydrated--and with a couple of shots and three trips for IVs and lots of tender care here, she rallied and has become the best little pet. Awww, what a sweet treasure to share. I'm sure it will bring smiles for many years to come. Hi there. Just checking out all the "Love participants" Your blog is lovely. I'm off to check it out some more. any handmade cards, notes or drawings from your own children & love ones are precious! yours are so sweet LOVE!.. That is the sweetest thing, ever! Does he call you Granny? That's what we called my precious grandmother who I loved more than anything or anyone! This was so precious! Oh my isn't this precious? Don't you just love grandchildren? This is a beautiful card...you can look at that card at anytime and I bet you end up with a smile. it was so nice to have you visit...come back again..
My BFF called her Grandmother "granny" To me it always have a funny ring to it. Being French it was Grandmere. Funny how children pick the name they like and stick with it. SOOOOO VERY SWEET AND PRECIOUS...PRICELESS. I SO LOOK FORWARD TO THE GRANDCHILD I MIGHT HAVE ONE DAY. That is so priceless. What a great treasure to keep always! This is such a treasure!! You are a much loved Grenny!!! Oh my! I am so envious! I am just dying for a grandchild. Kiddo gets married in August...I have hope! His little note is just the sweetest! Now that is just too precious! I'm going to be a grandma in May. Love it! How sweet is that and how precious it must be to you. It is all about LOVE! Hi Debbie....being a grandmother is just the best...I can't wait for our Miss Baby to be able to communicate a little better and actually recognize us when we get off the plane!! She's getting there....she's a babbler and a pointer....see you soon...bring pictures!! Sue. Hi Debbie....Having grandchildren has just been so much fun and I know how much little things like this mean. I save everything like this! My aunt just recently gave me some things that I had created for my Grandmother years and years ago. I had no idea she had saved them. What great keepsakes I now have from my own childhood. Loved your post! I believe God reserves a special corner of our heart just for grandchildren. Do you ever feel like you could just eat him with a spoon, like ice cream, because he is so sweet? I know I do. Ohhh my...I can't think of a better representation of the word "LOVE"!!! 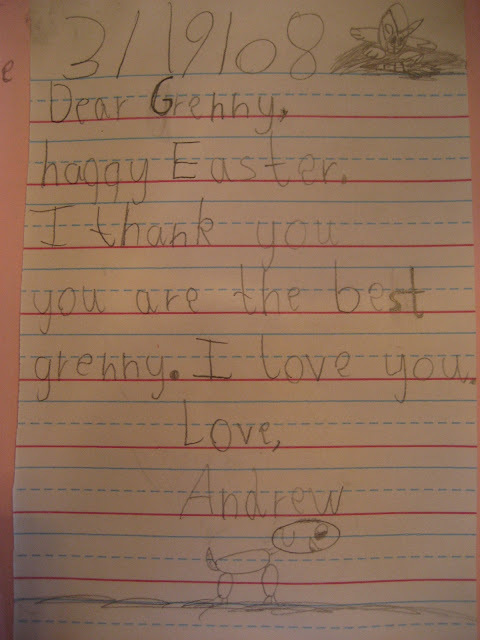 I'm sure that this little love letter from your Grandson Andrew is among your most treasured possessions!!! It's just precious!!! Oh so priceless. Memories ! That is so totally sweet! Love it. I love your precious handwritten gift from Andrew! So sweet! ça c'est joli...le meilleur trésor de tout! Is that the most precious card?!! You're a lucky gramma! Hand drawn hearts and love notes from Andrew...soooo sweet! Thanks for visiting my blog. I love the music for your blog, little children tunes are so FUN! Also love your Working Staff...do they get raises in their catnip for doing good work?! What sweet little treasure!! That will be something that you will always have to hold near to your heart. My grandmother still has something up that I made her in Vacation Bible School. I am telling you that had to be over 25 years ago! Oh! So sweet! Can't wait until my grands can write!